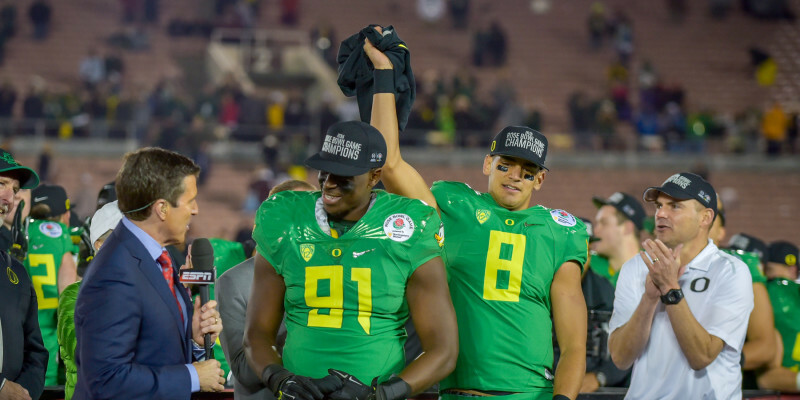 When it comes to character off the field, we know Marcus Mariota is a class act. While Jameis Winston certainly has had issues controlling himself off the field, he has proven he knows how to take care of business on the field (except against the Ducks). The NFL Combine is a place where players can come and while competing, can forget about all their off-the-field battles. With Mariota and Winston almost certainly being the No.1 and No.2 quarterbacks in this draft, many would be looking to combine performances to help set the two apart. This morning, Mariota clocked an unofficial 4.52 second 40-yard dash (best of any quarterback thus far in the combine) compared to the 4.97 second mark set by Winston. One must remember that the days of the pocket passer in the NFL are slowly dying. With the way defenses play now, it almost behooves a quarterback not to have running abilities. While the Tom Brady’s and the Peyton Manning’s of the league have been very successful, the push for having someone in the pocket who can use their feet as an escape route is becoming more and more needed. It was expected that this quarterback race would be close. Even with the Oregon and Florida State pro days still to come, these combine performances very well could shape coaches’ opinions. If Mariota can stay strong through the combine and consistently better Winston in every competition, then we might see our beloved Duck as a unanimous No.1 pick in the draft. Stay tuned to FishDuck.com for the latest in Mariota, and Oregon Ducks news from the NFL Combine in Indianapolis, Indiana.